They're even getting a few blooms here and there. I only had enough netting clips to cover four of the five rows so the fifth row was the "sacrificial lamb" but they haven't been touched by the deer! They've either moved on or don't want to be around the rest of the netting. 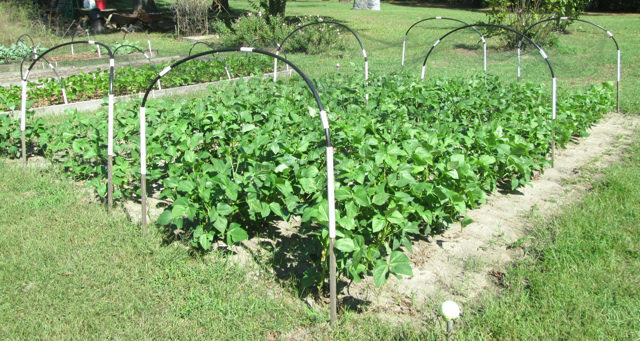 That morning I also put netting over the bed containing the collards, cabbages and four of the broccoli plants and the bush bean bed. The beans are in the bed just behind the field peas. 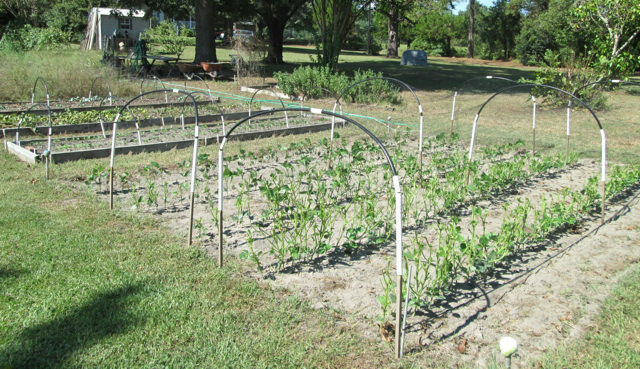 The bed with the kale and other broccoli do not have netting and have been left alone. They're up near the top of the garden and out of view. I am just amazed how fast stuff recovers. One year, I tried growing some sweet potatoes outside the garden fence. They looked wonderful until the deer mowed them down. They did come back eventually. Good Luck, and give peas a chance... But seriously, I've grown peas in the fall, and given the right conditions - they can produce well. I haven't grown Red Ripper, but Black Eyed Peas have done well here in Texas. We actually had the last glean of peas for thanksgiving dinner last night, which were planted in April. The peas had a setback with our 'winter in June' and didn't produce the main crop until august. Then being neglected they oddly sprouted from the roots again and made clusters of peas just inches from the ground, which I continued to pick through september... I was surprised to find another cup of shellies when I tore up the plants yesterday to prep for garlic. We have no deer here but moose do regularly visit... kale and cabbage are their favorite!